Set the test time to be 5 minutes in the schedule team for the purposes of testing it out and then run the test command (or save if fully confident). Remember to reschedule later. Note 5 minutes is the lowest frequency you can use. If you have followed my example you will have had a failure which is not immediately obvious why. The first options in the drop down select box cover those applicable to the number value and the MATCH and CONTAINS are applicable for when choosing a string. 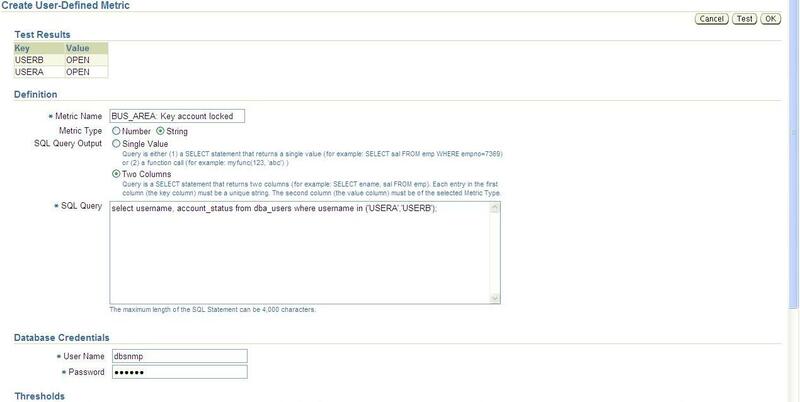 The test results show the result of the query and the UDM can then be saved. 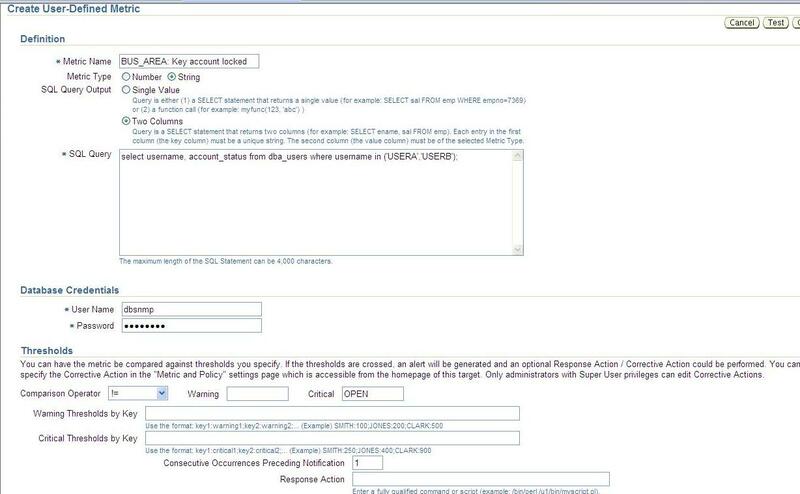 Now it is time to schedule the job but first lock an account to ensure the UDM has something to pick up on. One trick to see when the metric is next scheduled to run on the agent is to set the environment to the agent home and execute the command below and search the output of what the scheduler has been doing. Normally the metric page will show the last time it ran but this is the first run so the field is empty in the screenshot below. If you want to know details of what collections are enabled then look in the $AGENT_HOME/sysman/emd/collections directory and search for a file called oracle_database_SID.xml or rac_database_SID.xml if RAC system. PS Note that if you are creating a UDM on a RAC cluster do it on the cluster not the instances. A few minutes later we have an metric raised that one of our accounts is locked. To set a notification up go to the home page and the preferences / notification rules. If you have a dashboard enabled then the alert will be raised in that automatically. Create a new rule and stick to the same naming convention of business area that we chose earlier. Decide if you want e-mail notification (Preferences / General page to set up if you have not done so already). 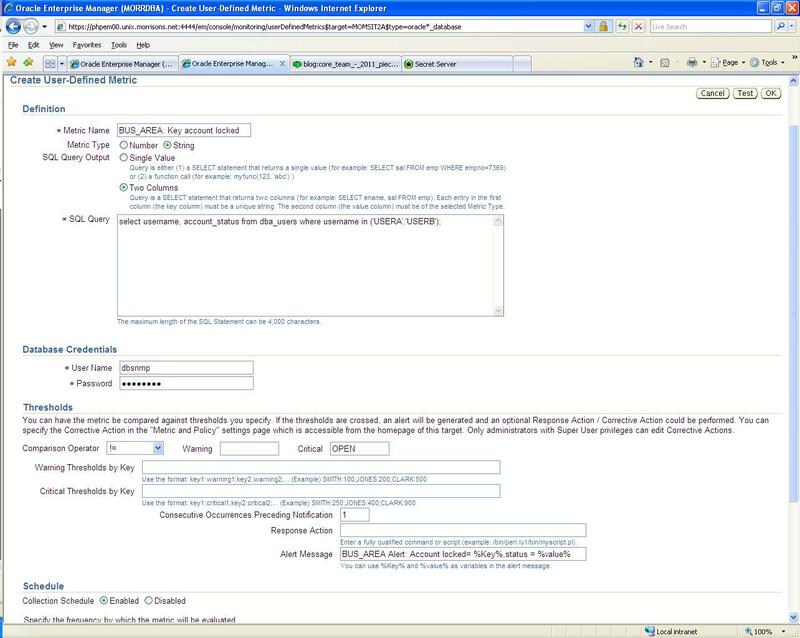 Then it is a matter of selecting the instance or group of instances that you want the notification to act on. The Metric name in the Notifcation rules is always ‘User Defined Numeric/String metric’ which sometimes makes it hard to distinguish if you have multiple metrics. If you are geting several notifications for a metric then check that script is selected rather than all object. select target_name "Database", key_value2 "Vdate", value "Result", collection_timestamp "Collected"
I hope that has been helpful. In my next blog I will demonstrate how to graph application server memory utilisation over time and also raise an alert if it exceeds a threshold. This entry was posted on December 8, 2010 at 11:36 am	and is filed under Grid control and agents, Oracle. Tagged: Grid, OEm, udm, user defined metric. You can follow any responses to this entry through the RSS 2.0 feed. You can leave a response, or trackback from your own site. How to run this across the databases (i.e. More than one database) . How to create User defined Metrics Reports with multiple metrics for e.g. 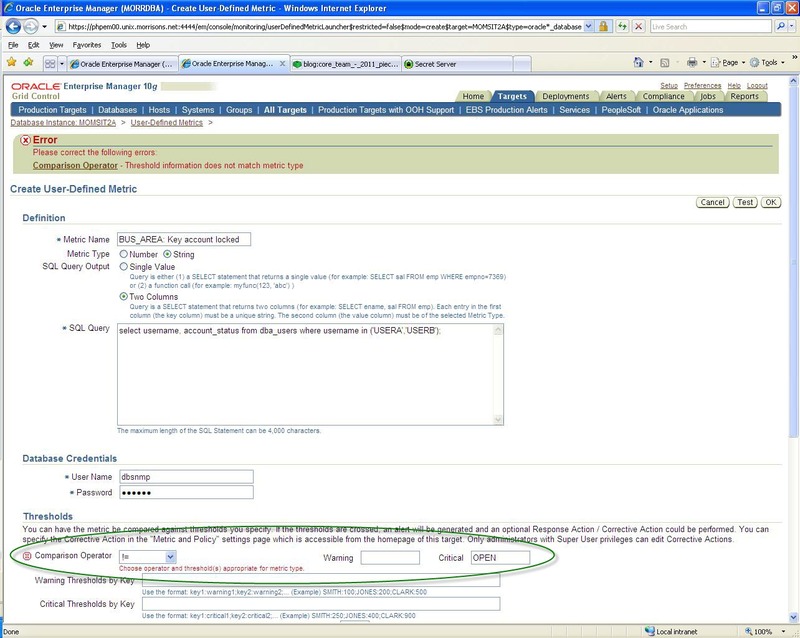 Space on Database for e.g. SYSAUX Tablespace >90% Full. 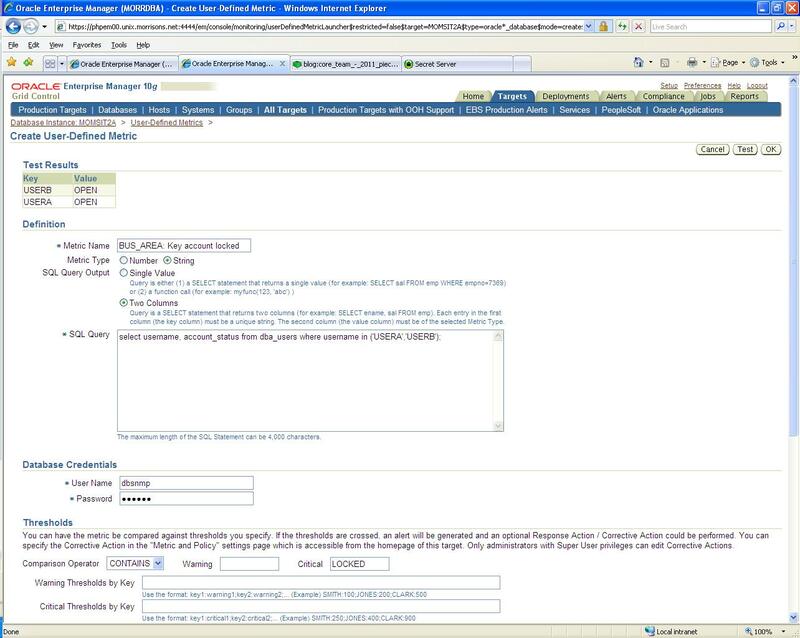 UDMs can only be created at the host, database and middleware level as per OEM Documentation. 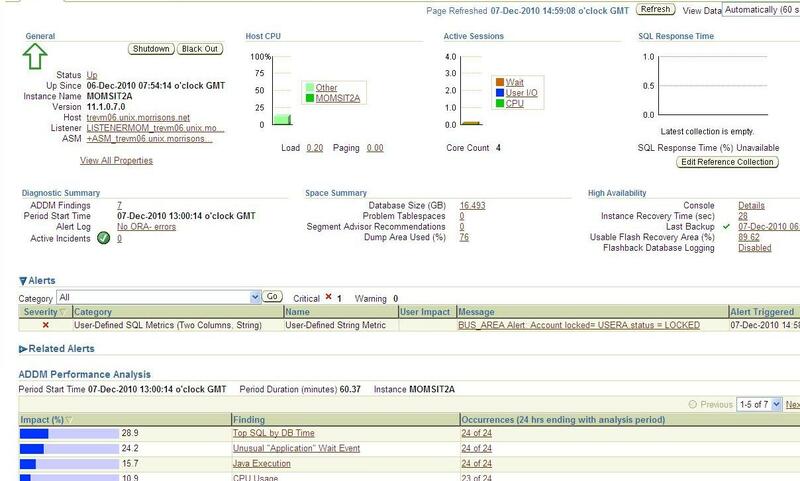 But we can deploy it across many targets using Monitoring Templates. So I need to create OS based scripts to monitor the OS related parameters. And for SQL based need to have scripts in sql. Question remains is it possible to view them as a report , I think answer is no as this is an alert type action, I need something like a report,is there any way to do the same? are we able to check who created the specific UDM, is the any table we can refer to? 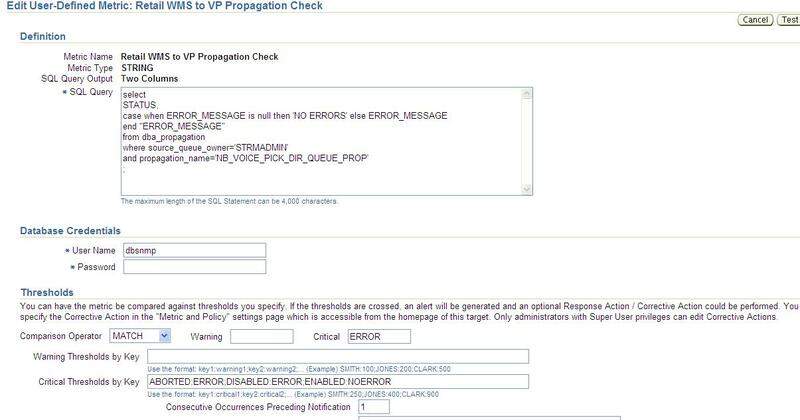 How to create UDM for getting the full description of ALERT log ORA- error message in the email.